There's no set route for the End to End. You can do it entirely along roads or you can navigate your way through forest, field, and mountain. 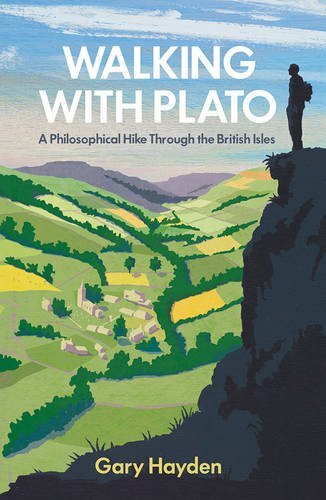 Walking with Plato by Gary Hayden, published by Oneworld Publications. Author Gary Hayden set off on the 1,150-mile trek from John o’Groats to Land’s End with no intention of writing a book about it. Luckily for us, he changed his mind. Read my Rose City Reader interview of Gary Hayden here. Sounds like an interesting journey...thanks for sharing. I looked at the cover, and thought "not for me", but then I read the opening line and the publisher's summary. Definitely for me... thanks for sharing, I'm going to read this one. We have so many walking programmes on our domestic television channels these days and this one sounds like another excellent candidate for televisation. Lands End to John o'Groats, or indeed the reverse, is a very popular challenge, by whatever unique means possible, for those wishing to fundraise for charity, so to learn about it from a more philosophical viewpoint would actually be something very different. Ooh walking through nature. I like that idea! Btw, please ignore the "Goal post" in my link. For some reason I didn't catch that when I linked-up. This goes on my To Be Read list! This one sounds interesting. I'm just not sure if it's my kind of book. I hope you enjoy your book this week. Have a great week!!! Happy reading. This sounds like it could be interesting - not my usual kind of book but different. Thank you for sharing Gary's information. It sounds like a great book to inspire some New Year's resolutions. I've read Bill Bryson's book about walking the Appalachian trail and Strayed's Wild. I'll be on the look out for this one, too.